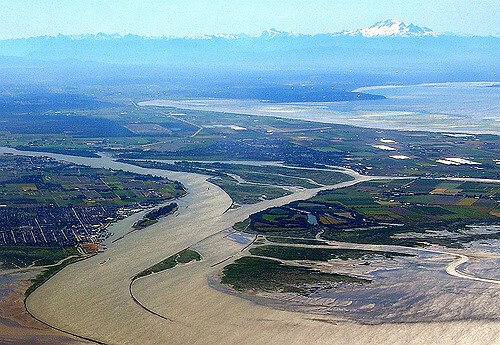 Aerial photo The Fraser River Estuary, captured by Stephen Rees. Fraser Voices, a society that advocates for the Fraser River Estuary, has released a slideshow exposé, “Let the Fraser Live!” It shows that the industrialization of the Fraser threatens “the world’s greatest salmon river” and “the endangered Southern Resident Orcas,” along with the estuary’s vital Wetland of International Importance. That situation can still change, but only if British Columbia elects a suitably different team of decision makers on May 9. As it is now, dock facilities are expanding east of the George Massey Tunnel in preparation for an influx of Panamax and lower-end Aframax vessels, some bearing over 80,000 tonnes. If the ship channel is dredged much deeper and the tunnel is removed, the Fraser port activity could rival Burrard Inlet’s. Leading the way is Fraser Surrey Docks (FSD). Since 2012, FSD has aimed for capacity to ship 8 million tonnes of American thermal coal from the Powder River Basin per year. At the Surrey terminal, the coal was to be directly loaded from railcars to barges bound for Texada Island, with its deep-sea docks, so large vessels could ship it to Asia — for smog-producing power plants. Tellingly, in 2015, the Vancouver Fraser Port Authority decided that FSD can instead load the coal onto large vessels in Surrey. That implies removal of the tunnel, along with deeper dredging, in keeping with the George Massey Tunnel Replacement Project’s stated aims. Much earlier, the project’s 2012 discussion guide had called the tunnel “an impediment to expanded trade at Fraser Surrey Docks and points east along the Fraser River” because “many of the newer ocean-going vessels are too large to pass over the tunnel.” The guide promised that removing it would “open the way to new trade expansion locations”. Then, in the early consultations, many people objected that deeper dredging and larger vessels on the river would batter the estuary ecosystem, with related harm to the Fraser River system and Salish Sea. Since then, Fraser Voices members have observed that the project and Transport Minister have heeded the concerns by denying the aim while progressing toward it. In theory, proponents could prove that economic benefits would offset the environmental damage, but B.C.’s Ministry of Transportation, which must implement the government’s tunnel-removal plan, chose instead to avoid the issue. Despite the denials of aims, documents from the Vancouver Fraser Port Authority (VFPA) like a 2013 letter to the Massey project director and the 2013 president’s report, both obtained by Freedom of Information requests, revealed the ongoing intent to dredge much deeper to suit larger vessels, as in FSD proposals. But the Ministry of Transport simply claimed, in response to the EAO, to be “unaware of any plans to dredge the river deeper.” And the Vancouver Fraser Port Authority “confirmed that VFPA currently has no plans to dredge the Fraser River to create a wider or deeper navigation channel.” The B.C. EAO report tacitly accepted the misleading comments, to the detriment of the estuary and all concerned. As well, it appears from the EAO report that the VFPA will make all the decisions on further dredging of the ship channel and the extensive turning basins required for the expanded dock facilities. Since the port authority is the main proponent and beneficiary of the industrialization of the Fraser, the estuary will have little protection left if the tunnel is removed. In a Business in Surrey article, FSD CEO Jeff Scott has described a plan to keep doing some extra dredging with each year’s maintenance of the ship channel. That way, the channel will be the desired depth and width for much larger vessels within five years. After tunnel removal in 2022, the influx of big sea-going freighters and tankers would take over the Fraser. That said, British Columbians can still choose to save the Fraser for wild salmon and ecological riches. The last best chance to get it right is the 2017 B.C. election, coming on May 9. Want to read more? Check out the rest of this blog series at Dogwood BC. On the very day of the televised leaders debate for the 2017 BC Election, Premier Christy Clark has suddenly found a reason to ask Prime Minister Trudeau to ban thermal coal exports from BC ports. It aims at the thermal coal from the U.S., and it would especially affect the Fraser Surrey Docks situation. Here’s the September 26, 2017 Clark-to-Trudeau letter, https://gardencitylands.files.wordpress.com/2017/03/pmjt-april-2017-re-coal20170426.pdf. Every victory counts, so this is good news, even if it reflects desperate politicking and not necessarily commitment. Enough damage is being done at the Super port at Roberts Bank. It’s location on an Estuary says enough. Any spill would be devastating.